Kays Landing is a desirable gated community of about 146 homes built by Engle Homes between 2005 and 2008. 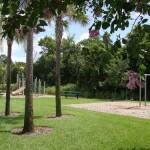 The community features a playground and community pool (HOA fees run only around $75, that is very reasonable!) 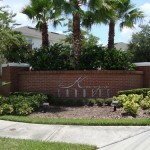 and has easy access to the Seminole Towne Center Mall, 417 and I-4. 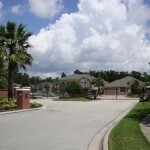 It is also conveniently located to Sanford and Lake Mary’s shopping, dining and entertainment areas. Kays Landing is located in what Jose and I call the “Sanford Mall Corridor of Upsala” (I know that sounds funny but hey, we have to give areas descriptive names sometimes… click here to learn more about Sanford’s communites and areas). It is an area that people usually like because of its closeness to the mall and major highways. Homes in Kays Landing are currently (2009) selling in the low to mid 200s. 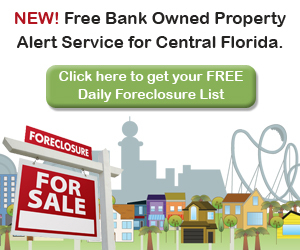 When the community was first built (at the peak of the Florida real estate market), homes were selling for up to $500,000 here! Home sizes range between 2,000 square feet and 3,400 square feet. Take a look at the property slider to browse homes for sale in Kays Landing. Community Pool: Easier to meet your neighbors and a great bonus if you do not have your own pool. Pavered Driveways: We believe pavered drive ways are an elegant upgrade to any home as they add great curb appeal. Another benefit is that they don’t crack like the regular cement drive ways do. Closeness to 417: Kays Landing has parts of the subdivision backing up to toll road 417. That is never a desirable location. Even though noise is low inside the home, when sitting outside on your porch you will certainly hear those cars driving up and down 417 if you are located in this area of the community. Just as in many other communities built in the early 2000s, homes in Kays Landing were built quite close to each other. We wish the builder had planned for just a bit larger lots.